According to Wikipedia approximately 150,0001 people die across the globe each day. It’s a given that we will all experience bereavement during our lives. Perhaps you are drawn to reading this post because you are going through the grieving process at the moment. There are so many ‘normal’ responses to grief. Sadness, anger, disbelief, shock, numbness, depression and anxiety to list a few and the time it takes to grieve is as individual as the person experiencing it. It can be difficult to grieve openly and for as long as is needed. Friends and family will no doubt try their best, but our society seems to shy away from talking about death for too long. Often there is plenty of support to start with, but it tails off as people resume their regular activities. This can make grieving a very private and lonely experience. If you have someone to talk to who will listen to all that you are experiencing without trying to fix you, it can be enormously helpful. If you don’t or prefer to talk to someone impartial, then counselling may be for you. I offer person-centred counselling and when I work with clients who are grieving, I offer a safe and helpful space to ‘be’ – whatever that looks like. A witness and understanding companion during the process of working through feelings, thoughts and behaviour. All feelings are welcome – even the ones which sometimes feel risky to show or too painful to allow expression. Talking is welcome. Tears are welcome. Silence is welcome. Sadly there are no quick fixes and the process is likely to be painful. The grieving process is what it is and if not allowed to progress at its own pace, will wait patiently until there is a time. Anyone looking at my Facebook business page recently may have seen the Worden’s tasks of mourning picture I posted. 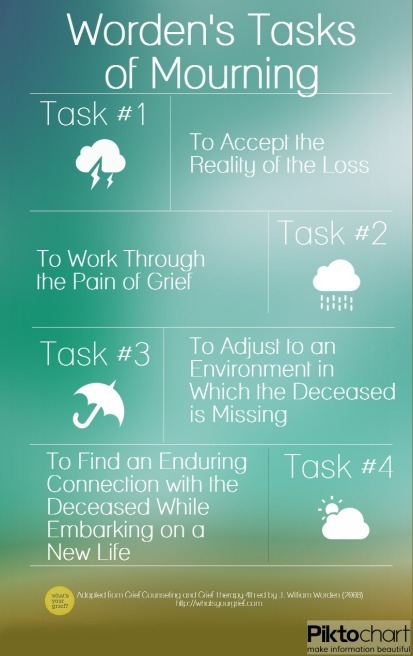 I like Worden’s four tasks, mainly because step 4 talks about finding an enduring connection with the deceased while embarking on a new life rather than ‘getting over’ the death of a loved one which I’m not sure is possible or should be seen as a goal. I too have lost loved ones and have ongoing connections with all of them and I like that. It’s not enough, but it’s something. Personally I use the term ‘finding a new normal’ to signify the desire to carry on with life, knowing it is different and that I am changed. There was ‘life before ……….. died’ and now there is ‘life after ………. died’. If you like reading, there are many books which can help you reflect. A search on the internet will bring up many on the subject. If grieving brings up fears around your own mortality then I would recommend Irvin Yalom’s Staring at the Sun. If you have suffered many losses and feel as though you’ve not been able to grieve fully for them, then Stephen Levine’s Unattended Sorrow is a helpful read. 1 Pings/Trackbacks for "Grieving: Finding a New Normal"